I just wanted to let you know what a great job Anna, Macario, and the crew did on the front landscaping. Anna took pictures yesterday so I hope you get a chance to see them. I hope she took before pics as well for comparison. A difficult area to work with due to the original poor design left by the previous owner which we could only change so much. And, the wet weather sure didn’t help any. Mud, mud, and more mud on days. I don’t know how the crew managed trying to work in that! – Marian C.
Thank you so much for coming every other week to maintain my property. Your crew does a terrific job every time they are here. I’m not sure why it took me so long to ask for help! — Jamie G.
We have had many landscapers over the years and no one compares to the service and quality of work Native Earth Landscaping provides. We look forward to continuing our working relationship with them and highly recommend them to anyone. — Richard S.
We would like you to know how very impressed we are with you and your crew. We are amazed at the excellent work done in moving the cistern intake to a different hose bib, and your solution to get water for the plants above the driveway wall. It is all invisible, and there are no bald patches where things must have been dug up! I was also impressed by the meticulous routine work – even to blowing the portals clean and tidying the gravel off the flagstone footpath! Thank you! Tim does GORGEOUS work and he does it right. Because he chooses only the best plants for the Santa Fe climate and helped us with choosing the right irrigation solution, nothing dies! 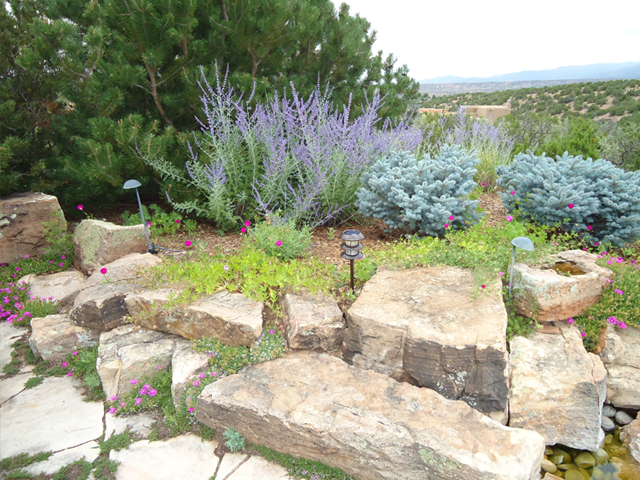 For anyone who has ever tried to landscape in Santa Fe, you may know that this is a minor miracle. Plus his designs are pretty, colorful and well placed. Tim did our first installation three years ago and it is SO pretty. It’s thriving. Everything looks great. Your crew are hard workers. I appreciate all they do. We bought our town home in Santa Fe a few years ago knowing that both the courtyard and backyard would need a major transformation. We followed our daughter’s recommendation and hired Native Earth Landscaping to “work their magic”. Thanks to Tim and his capable team, we have an impressive moss rock retaining wall, brick patios, a new fence that keeps out the wild life but lets in the view…all surrounded by a variety of trees and perennials. Our outdoor space is where we now prefer to be. Thank you. — Darla P.